It only takes one happy find on the beach in childhood to get you hooked - seashells are irresistible, inspiring, deeply fascinating.. The scientific side of shell collecting is Marine Biology - and that's where it gets really interesting! How do you find out what species your shell is? Read on..
Seashells are natural history objects (same as i.e. fossils or minerals). In fact, they are some of mankind's very earliest treasures. Looking at early archaeological digs, seashell finds turn up everywhere. Apparently we humans have always loved shells - there's plenty of evidence that we enjoyed collecting, wearing, trading and using seashells basically from the moment we became human beings. You could collect shells just as ornaments, or you could decide to learn more about the natural history side of collecting, which means also looking at their scientific value. You could become a conchologist (people who collect and study specimen seashells). Conchology is a branch of Malacology (the study of molluscs), which is in turn a part of the Invertebrates in Marine Biology. So what's a specimen seashell? For the most part it means a shell with good data (a label with accurate recorded origin information, see info below), which is kept with each item. What about value? Well, that depends: What is it (ID)? Where is is from? What does it look like (complete or damaged)? How big is it? How rare is it? In short: Any scientific collecting value is determined by data, condition (graded to Intl Standards), its size and availability - lots of things to consider! To help you work this out, there are magazines and seashell books that delve into any of these subjects as deeply as you could wish for - and there are many fabulous International Seashell Exhibitions and Trade Shows every year around the world, where collectors can meet, discuss, show and trade their shells. Rarity is a particularly interesting issue: New shell species are being discovered all the time - and named, described and illustrated in established quarterly or annual scientific magazines. Obviously, newly discovered species are very rare and exciting.. Interestingly, quite a few amateur collectors are describing new species, as they they tend to know more about their favourite group of shells than anyone else! Some amateurs are widely regarded and acknowledged as world experts. NAME / ID: A scientific name - this typically includes: Genus and species name, the Author (the person who first named and described the species) and the publication year. Sometimes there is also a local variant / form name or subspecies tag included. LOCALITY: Country or region of origin and any known details on habitat and depth. Locality info typically depends on the source: For example, we frequently scuba-dive remote areas and can often supply shells we have found with very detailed data, incl. GPS info (i.e. to 100m radius). We also may source shells from old collections (may have less info). Deep water trawled shells may carry even less data, depending on which boat they came from and how accurately fishing logs were kept. SIZE: Specimen size in millimetres, which always represents the largest measurable distance between the two outermost points of a specimen (except spiny Bivalves, where the shell body is measured without spines). DESCRIPTION: Mentions typical features, condition, shape, colour, pattern, presentation and/or major differences to other forms of the same species. OPERC / PERIO: Some species have shell doors (Nerites, etc. ), so we may include info on presence / absence of the operculum (shell door) or periostracum (soft surface coating). REFS / IMAGES: References to previously published information or images: Data labels may include refs to a particular publication (i.e. Image in a shell book). Seashell books - What shell is this? 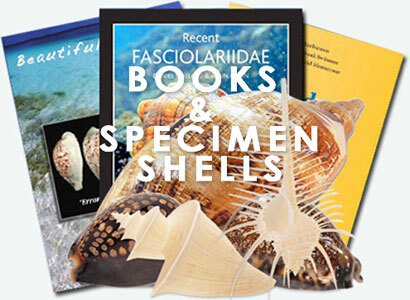 Other than coffee table books picturing beautiful shells, there are amazing reference books that illustrate all the gorgeous variety of seashell species, side by side with name and other helpful information, like average size, locality / distribution, etc. Holding a shell in your hand and finding a matching illustration in a book is a good place to start identifying your own shells. If you can't find a good match based on the images in a book (after all there is a lot of variety in shape, size, colour and patterns in natural seashells), the book will at least help you narrow it down to a great degree (i.e. tell you which family or group your shell belongs to). It will give you a scientific name and image that looks close to matching. So once you have a tentative ID, how do you to verify the species? Here is where the internet may help..
- More Images: Armed with a scientific name, you can look up additional images of any species online by typing the name in your search engine. Comparing your shell against many images of any given species (incl. all its variations) and looking at them side by side is the best way to establish a firm ID if you are unsure which species you might have. Specimen shells are frequently listed online for sale or as a reference only by their scientific (Latin) species name (i. e. on our pricelists). If you're unsure what a shell species looks like (if all you have is a name), you can look up its image via the latin species name. Bear in mind that not all IDs posted on the internet are correct (not everyone's an expert)..
- More Detail: You are trying to find a name for the shell you are holding and the additional images you see online for it still don't quite match? It is easy to use the internet to find out more on any subject or a missing detail - just look up other species in the same group (for example other species with the same Genus) at established scientific databases, such as www.marinespecies.org. However the internet is unfortunately not very helpful when you don't know where to start! For example: What group / family of shells am I even looking for? Unless you just need a few specific images or details online, surfing the net won't work. You'll do a lot of time clicking, typing and searching - time easily saved if you had the right book! As collectors and seashell dealers we need to look up information on shells all the time. We daily respond to customer queries and compare shells to images to find specific information as quickly as possible. Here is where having the right reference book becomes important: It helps you identify shells more quickly! You can compare your shell against images of close matches, all side by side on the same page. You can see immediately where your species might fit in the range of colour forms or which subspecies it very likely is. A typical collector may only use just a few well-chosen books - but those you'll use all the time. Depending on what you collect, you would usually have at least one general shell reference book (i.e. the Encyclopedia Of Gastropods) to narrow down options. And you'll want a book or two just about your favourite seashell family. It's great to be able to identify your own shells just by turning a page! And you will find out which subspecies and varieties you might still be missing.. With the basic info, additional research online becomes way more fun and much easier. GRADING: Notes the condition of a specimen shell by a commonly accepted International Standard of GRADING terms. Shells are without any discernible blemish or flaw. The specimen will be fully adult and of typical size for the species. Shells that have a very minor flaw or blemish which is hard to perceive, shows up only under close scrutiny and in no way detracts from the look of the shell. Shells have a noticeable flaw or blemish which does not detract from the look of the shell. Shells have more than one noticeable flaw, growth line or blemish consistent with the species, but the overall presentation is very good. These shells are generally excellent value and suitable for aesthetically pleasing collections, being considerably less expensive than GEM specimens. Shells with small chips, noticeable growth lines, nacre lifts, blemishes or other obvious flaws, where the overall appearance and presentation of the shell is obviously not perfect. NOTE: Several large sized or rare species are only available in F+ condition or less. Shells with major chips, growth lines, nacre lifts, blemishes or other obvious flaws. Very fresh dead collected but otherwise good specimens are also often classed as F/F+. NOTE: Some shell species are only available in F/F+ condition or less. Shells that are either badly damaged, obviously juvenile or dead, but suitable as a representative of the species or for study purposes. NOTE: Some shell species are only available in F or dead condition. No grading system can possibly do justice to every specimen and most Specimen Shells will require further description. Since seashells are difficult to photograph well (image may not clearly show flaws or can be tampered with), the above Intl. grading terms are widely accepted for seashell descriptions. Grading and photographing seashells well is not easy. As specimen seashells are by definition highly individual objects, there is still no better way to evaluate them than holding a shell in your hand and looking at it. So we are offering you a �Money Back Guarantee' for all our specimen seashell items, which means that you can return any of them for a refund (or online shop credit if you prefer this) to the full value of the item(s) returned, excluding shipping cost. In short, if you do not like the shells we have selected for any reason, you can send them back for a full refund or exchange if you wish. See also non-graded Seashells and Starfish for Decoration / DECOSHELLS.